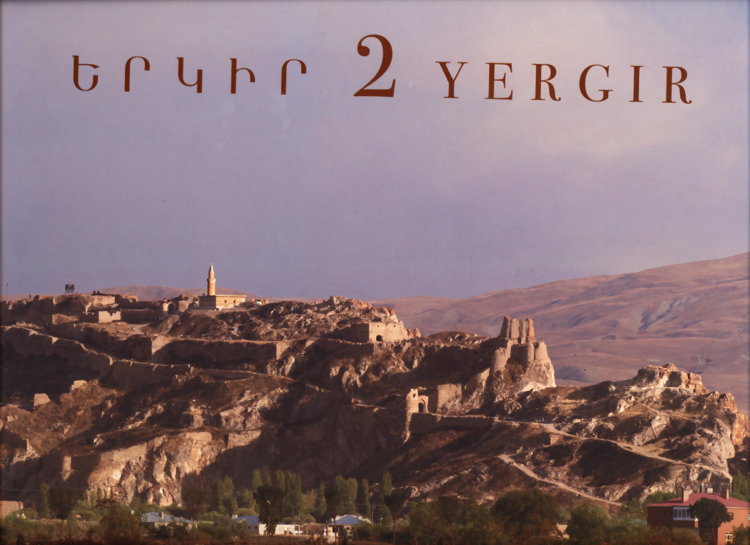 Երկիր 2 Yergir is a beautiful, one-of-a-kind coffee table book with full-page glossy pictures of historic Armenia. This album is composed of photographs by master photographer Hrair Hawk Khatcherian and includes subject matter that has never before been collected in a single volume. This book is the product of many decades of visits to regions across historic Armenia. Beginning in Cilicia, Khatcherian takes his readers to major centers of Armenian life before 1915. These places include Zeitoun, Aintab, Urfa, Hadjin, Sis, Gesaria, Palu, Ezerum, Ani, Kars, Van, Moush and many other places. The photographs of the landscape are also accompanied by striking images of Armenian pottery, khatchkars, frescos and tapestries. A particularly intriguing feature of the book is the photographer's interest in capturing the remnants of Armenian life in Turkey. He documents what became of Armenian churches and homes after the Armenian genocide and, when he can, juxtaposes modern landscapes with images of the same landscapes from more than a hundred years ago.